USA Figure Skating Team: What To Watch : The Torch Fourteen skaters in individual, pairs and dance categories will travel to South Korea next month to try to bolster America's sterling reputation in one of the Olympics' most popular sports. 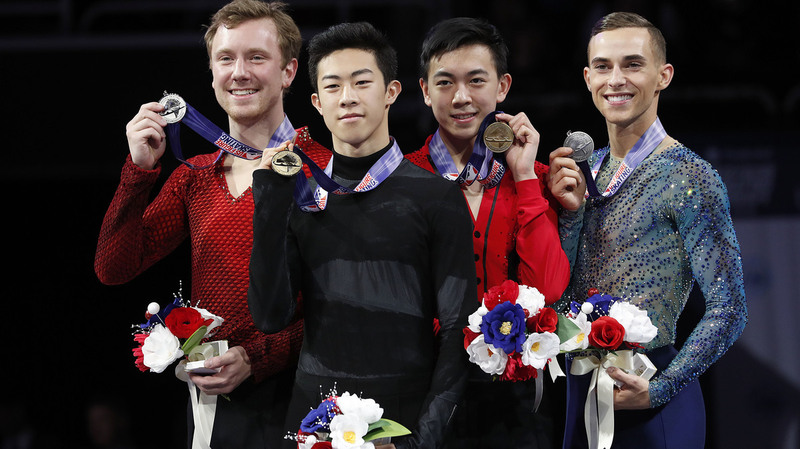 Nathan Chen, foreground, smiles after winning the men's skate event between Ross Miner, left, who finished second, Vincent Zhou, second from right, who finished third, and Adam Rippon, who finished fourth, at the U.S. Figure Skating Championships in San Jose, Calif., Saturday. Since 1908, when figure skating was first contested at the Olympics — strangely enough at the Summer Games — the United States has won 49 total medals — second only to perennial figure skating power Russia (and the Soviet Union before that). Here are six things to know about the skaters and teams heading to the Olympics. Eighteen-year-old Nathan Chen was excited to be named to his first Olympic team. Really. He was. Even though Chen dominated the men's competition, winning his second straight U.S. title; even though he's ranked fifth in the world, and has been skating better than his rivals ahead of him; even though his selection for South Korea was considered a sure thing — heck, he called it 8 years ago. Even with all those evens, when he got the text before he went to bed Saturday, telling him he'd made it, Chen was "so, so, so excited to be part of this team." At a Sunday press conference, Chen also clarified that prediction he'd made long ago — lest we think he was a 10-year-old a little too full of himself. "It was more centered around the fact that I would be age-eligible for 2018," he said, "obviously that was my goal. That's what I wanted, but I honestly didn't really think it would be attainable. I thought that 2022 would be more in my sights, since 2018 was just so close." Joining Chen on the Olympic team is Vincent Zhou, who won the bronze medal Saturday night. Zhou also appears to be a skater ahead of schedule — he's only 17, but speaks with poise and depth that make him seem years older. "There's a certain feeling, meaning, that comes with the word Olympian," Zhou said Sunday. "To have that attached to my name is more than I could ever ask for my entire life." Zhou has been building to this. He won the 2017 U.S. silver medal and ended last season as the 2017 World Junior champion. He and Chen excel in the technical aspect of skating — both can land multiple quadruple jumps in their programs. In his winning long program Saturday, Chen landed five quads, as he did when he won the 2017 title. Adam Rippon couldn't be more different from Chen and Zhou in skating style, temperament and age. Yet Rippon will join them as the third and most popular member of the U.S. men's Olympic team. Rippon has a legion of fans who love his honesty, his humor, his openness about being gay — he came out to the world at large in 2015 — and about his skating journey. He's battled injury and illness and never was able to make an Olympic team. Until now, at the age of 28. "I'm over the moon," he said Sunday. Rippon's selection was a bit controversial, although controversial probably is too strong a word. Rippon finished fourth Saturday but was named to the team. Ross Miner, meanwhile, skated one of his best ever long programs in San Jose and won the U.S. Nationals silver medal, finishing second. But he didn't make the Olympic cut. The selection committee doesn't only consider final results at the Nationals. It's the body of work that counts — how a skater has done at major domestic and international events in the year or two leading up to the National championships. And by that measure, the consensus was that Adam Rippon deserved his Olympic spot. "Ross had an amazing, lights out performance [in San Jose]. However, we had to look at the body of work," Auxier said. "Ross does amazing at U.S. Championships, but frankly he has struggled at some of the international competitions." "We looked at all sorts of statistics," he continued, "head-to-head competition, average scores, momentum within the scores as we lead up to the Olympics, and that's where we really had a challenge with Ross. His average score was lowest among the pool that would be considered for the Olympics. He had some really challenging skates which led us to the conclusion that, we weren't sure if we put him out at the Olympics that he would perform to the extent that there's a possibility for a medal." The vote by the selection committee was 11 to 1. "When I found out who the Olympic team selected," Rippon said, "the first thing I did was I texted Ross Miner and told him I was so proud of the way he skated [Saturday] and so happy for him because I understand the ups and downs of a skating career. And he texted me right back and he said he was really happy for me, and that meant a lot to me." Rippon is close friends with female skater Ashley Wagner, and now they have an Olympic qualifying experience in common. Four years ago, Wagner finished fourth at the U.S. Nationals but was chosen for the Olympic team over third place finisher Mirai Nagasu. Wagner made the most of her 2014 Olympic experience, helping the U.S. win a bronze medal in the new team event. Four years later, Wagner was on the outs and not happy about it. She was considered by skating insiders the "sure thing" of the women's competition in San Jose — meaning only an extreme meltdown would deprive Wagner of an Olympic berth. The meltdown didn't happen, at least in her mind — she described her performances in the short and long programs as "solid." But the judges didn't agree. She ended up fourth, again, a position that left her "furious." And it left some in the skating world arguing that she was wronged and the victim of forces beyond her control, while others said Wagner had no one but herself to blame. This time, Wagner couldn't overcome her fourth place finish at the nationals. The top three finishers ended up on the Olympic team. Like the men's team, the women's team is made up of two teenagers and a 20-something veteran. Nineteen-year-old Bradie Tennell, who won the 2018 Nationals with a long program that included clean landings on all 11 of her jumps; 18-year-old Karen Chen, who won the U.S. title in 2017; and 24-year-old Nagasu, the skater who was leap-frogged in 2014, and will now return to the Olympic games. She finished fourth in Vancouver in 2010. Nagasu, the old-timer of the group, is a fan favorite — a powerful jumper and a beautiful, artistic skater. She's one of only two American women ever to complete the difficult triple axel jump in international competition. Her coach says even non-skating fans knew of Mirai as the poor skater who didn't make the Olympic team in 2014. But in last weekend's press conference after the competition, Nagasu, admitted she was the one responsible for her failure in 2014. "I was a little bit careless over the season and didn't put out the body of work that I needed," she said, "And so I didn't want to feel that same way this year, and so I took on the full responsibility of becoming a stronger competitor and person." Karen Chen is the third won last year's U.S. Nationals. She was sick as a dog the day before last week's long program but she said she consulted her sports psychologist, her acupuncturist, other doctors. She just toughed it out and skated a really nice program, good enough for a third place finish and a spot on the Olympic team. While individual skaters get most of the attention, the U.S. has high hopes that its ice dancers continue a recent winning trend. American dancers have won a medal in last three Winter Olympics, including a gold in 2014 for Meryl Davis and Charlie White. Among the teams heading for South Korea are Madison Chock and Evan Bates — they were 8th at the 2014 Olympics and finished third in the competition in San Jose. Madison Hubbell and Zachary Donohue won this year's U.S title and will be competing in their first Olympics. Finally, the brother-sister act of Maia and Alex Shibutani, two-time U.S. champions, were named to the Olympic team; they won a bronze medal at the 2017 World Championships and a silver medal at the 2016 worlds. The U.S. hasn't had the same success in pairs competition. The last time American pairs skaters made it to an Olympic podium was 1988, when Jill Watson and Peter Oppegard won a bronze medal in Calgary. The country is sending only one team to South Korea, hoping that U.S. National champions and husband and wife Chris Knierim and Alexa Scimeca-Knierim break the drought.